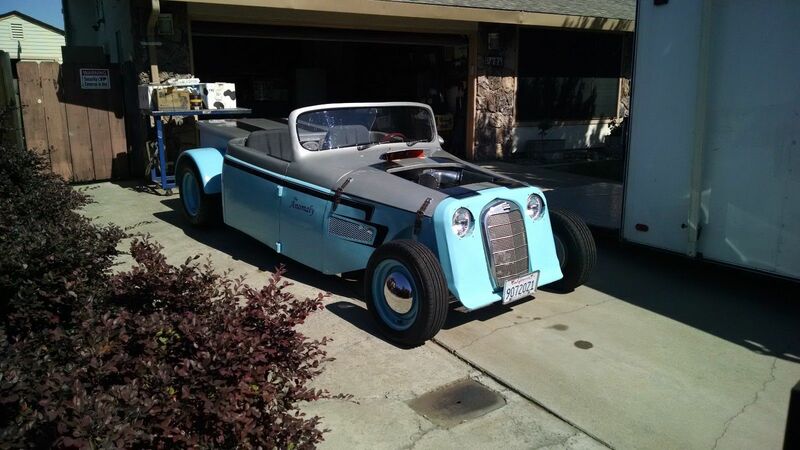 Over the period of 1 year, the Owner Built this car in his garage “By Himself”. The Owner welded the frame installed the front and rear axels mounted the 350 Chevy engine and 350 Chevy transmission, and the S-10 rear end. He modified the original 1956 International cab by cutting the top off chopping the windshield 6 inches, sectioned the lower body 5 inches and mounting it to the frame. He built the bed from sheet metal, built the rear fenders by adding 4 inches to a set of trailer fenders. He built the hood and hood sides held down with leather straps like the old British racing cars. He modified the Jeep mail car grill and added a narrowed 1960 Mercedes grill inset 1 ½ inches into the front nose. He did all of the upholstery, all of the wiring, cut down the rear fiberglass cover from a full size Ford pickup that is gas shock assisted and locks for security. He did all of the body and paint prep work right in his own garage, and sprayed the entire car in a rented paint booth. And "Just for the Kids" he added a little face looking out of the cowl vent, complete with fingers gripping the back of the hood. It's not pretty but It's the only ONE!! At first, this offended my sense of aesthetics, but the more I look at the craftsmanship, I think.. dang, this guy did it. He built a car '50s style. Hat's off dude! The only problem is, he's probably the only person on the planet that this shape appeals to. The front suspension on this is certainly, um well it's very much something or other. That Panhard rod is certainly going to make turning left and turning right a different experience. And an interesting use of a lever shock and random bits of welded together axle.